Hi Friends! Welcome to this month’s Theme Furniture Makeover Day. 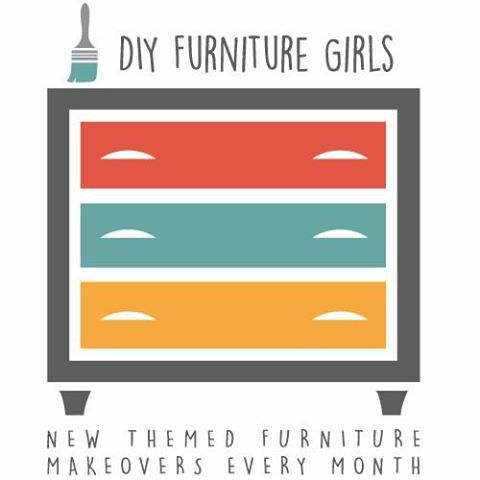 This month’s theme is “Knockoff” where I, along with my blogger friends, makeover a piece of furniture inspired by a high end store. I’m so excited, as it’s one of my favorite themes. You didn’t think I was going to reveal the full makeover right away, did you? Of course not, I would love for you to keep reading to see what I did the these old accent tables. 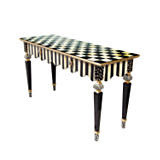 Have you ever seen MacKenzie-Childs furniture/assessory pieces? 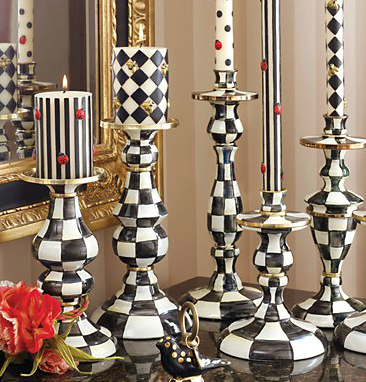 Well they are stunning as they are each hand painted and quite pricey. 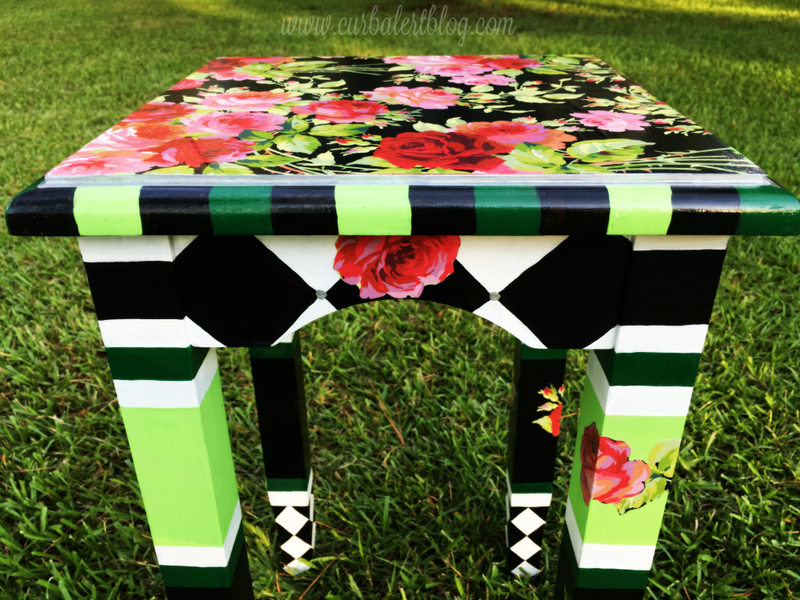 After I tried my hand at hand painting my own piece I can see why, it took lots of patience and a very steady hand! 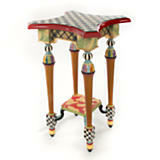 Here are a few MacKenzie-Childs pieces that I love..
Yep, pricey but desirable to many. I have seen stunning entire collections of their products and they are gorgeous in person. 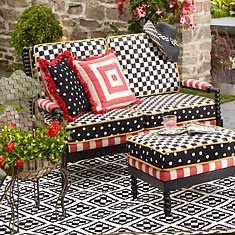 Did you happen to notice the black and white checkered theme throughout? I did and that’s what I tried to replicate. 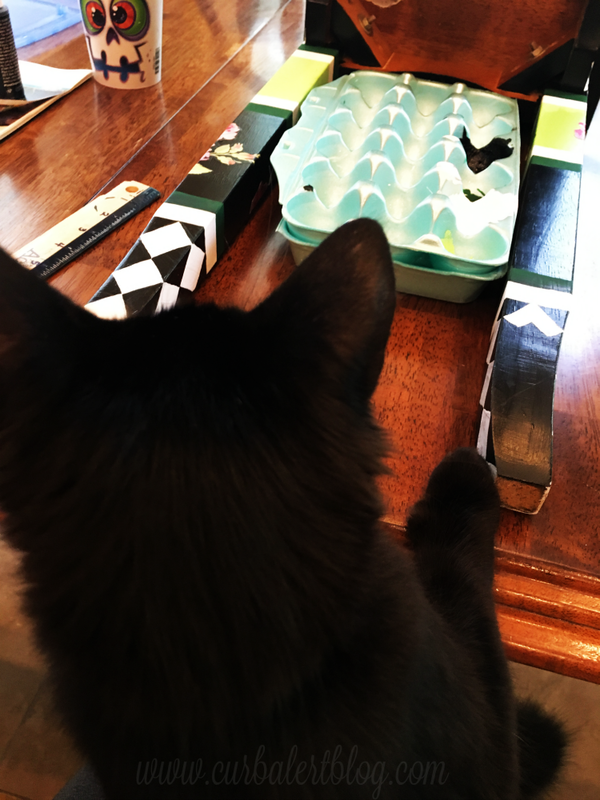 I first started with this pattern that I found. 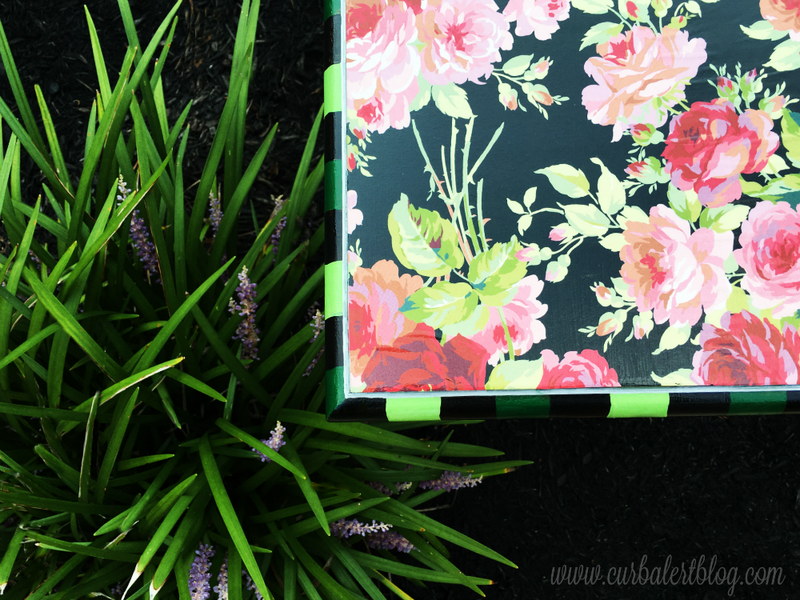 It’s a scrapbook page that I decoupaged on the top with ModPodge. Luckily I am a very patient girl so I was bound and determined to complete it as planned, in the true MacKenzie-Childs Inspiration! 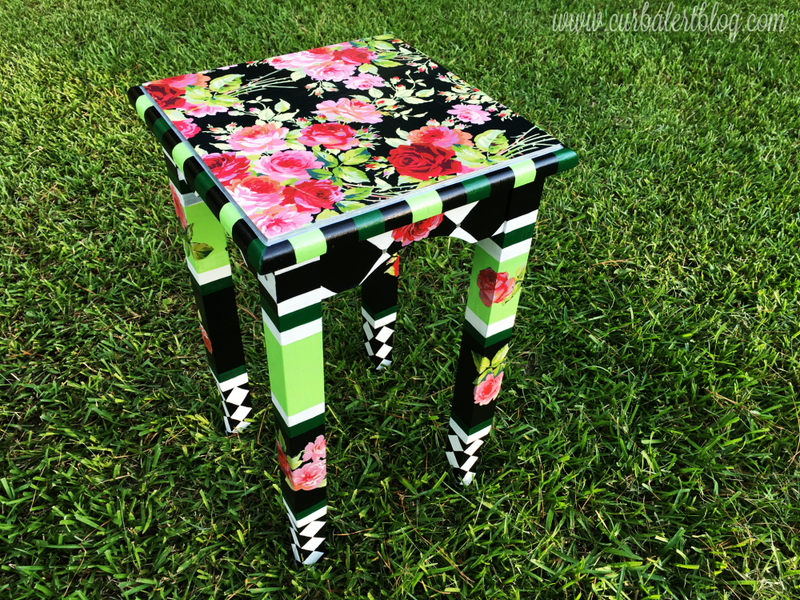 I also cut out some of the scrapbook paper and decoupaged it to the legs of the table. My husband thought I hand painted them on – ummm, okay whatever. 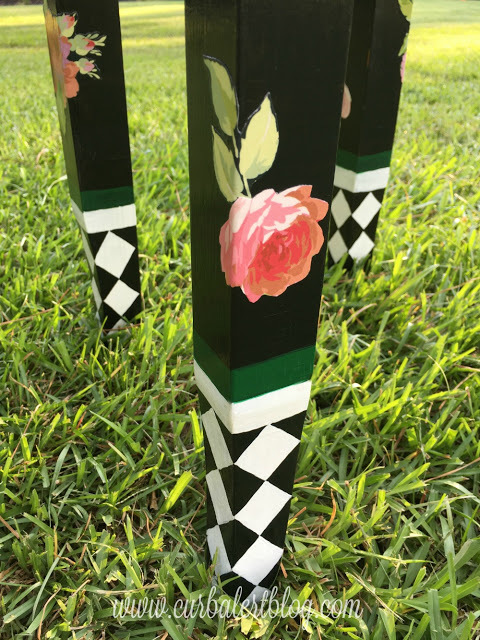 It’s so much easier to paint on a straight piece instead of curved legs like I did (lesson learned). Measure and sketch out your pattern with a pencil first, free-handing this step is HARD! 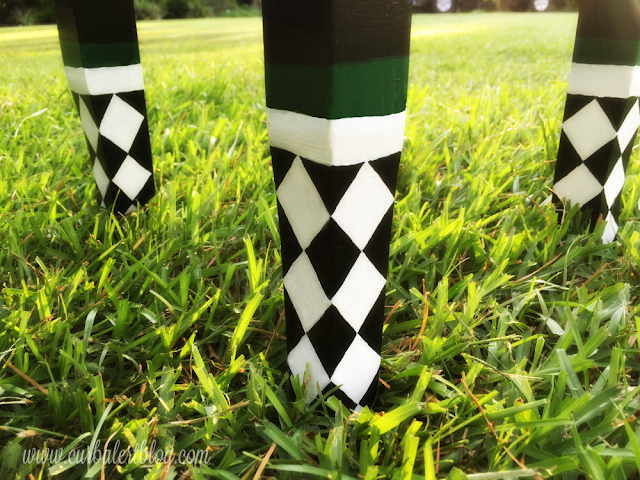 Paint the white portions first, then paint over with the black lines (trust me). Make sure you have plenty of time and patience, it’s not a quick project. A quick look at Before! Maybe, just maybe I’ll replicate it on the other table – I’ll let you know! Amidst all of the frustration, I am quite pleased with the outcome! 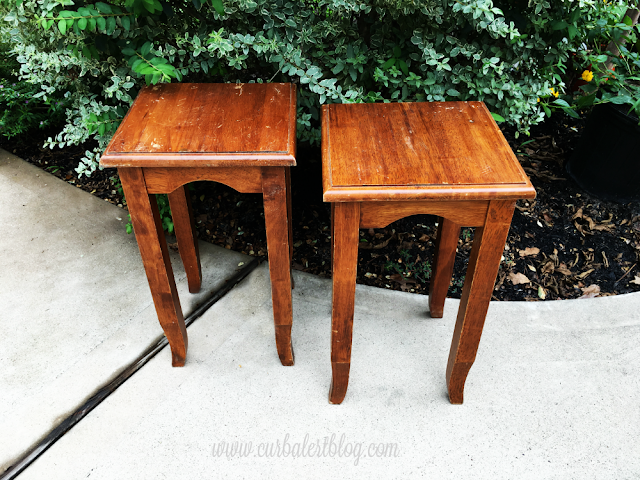 Please let me know your thoughts in the comments below and then take a moment to stop by my friends’ Knockoff Inspired furniture makeovers!